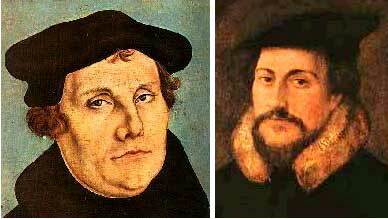 Differences Between Luther and Calvin – Called. Convicted. Converted. 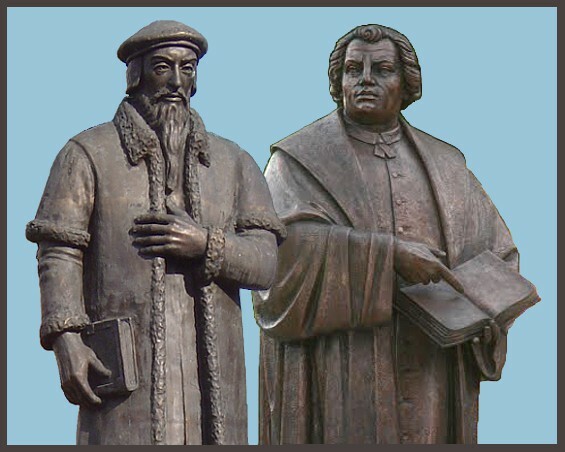 Luther and Calvin were two men that God used mightily in the Protestant Reformation. Both men loved the Lord, both men held to the 5 Sola’s, Christ Alone, Faith alone, Scripture Alone, Grace Alone, and everything to The Glory of God Alone. But they did have their differences. Today’s post in a just a brief survey of some of those differences. – Justification and Good works. Calvin made an effort not to stress the New Testament over the Old. He emphasised the continuity of God’s revelation throughout the whole Bible. Unlike Luther, Calvin did not play with whimsical allegory. It is true that Luther brought the Bible into the fore of theology and life, however Calvin put the structure down for Biblical study and exposition. Calvin’s city of Geneva became a respected place of Biblical exposition during his time. Calvin and Luther disagreed about the Lord’s Supper. Calvin did not believe that Christ was literally in the bread and wine (obviously, since Christ is literally, physically as the right hand of the Father).He also disagreed with others who argued that the bread and wine are merely symbolic. Calvin reasoned that when we take the bread and wine, Christ’s presence come to us. Jesus communes with us as we partake. Calvin explained it using the analogy of the Spirit coming in the form of a dove at Jesus’ baptism; he wrote, “Our Lord, wishing to give a visible appearance to his Spirit at the baptism of Christ, presented him under the form of a dove. St. John the Baptist, narrating the fact, says, that he saw the Spirit of God descending. If we look more closely, we shall find that he saw nothing but the dove, in respect that the Holy Spirit is in his essence invisible. [iv]” In the same way, though the bread and wine are symbols, Christ really does come to us and is truly present if we partake by faith. It has been said that Calvin taught double predestination and Luther only single predestination. Double predestination is that God determined by the council of His will, who would be saved, and at the same time passed over others thus predestining them to damnation. Single predestination only acknowledges the first positive kind (that God elects those he will save), but denies that God is involved in reprobation (passing over others and thus reprobating them). Interestingly it appears that Luther did indeed hold to double predestination, but it was his followers after him that denied reprobation. Thus Calvin and Luther agreed on this, but Lutherans and Calvin disagreed. 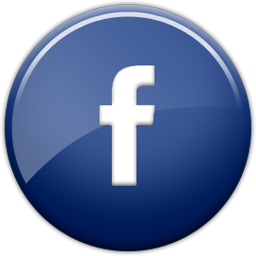 For more on this issue read this helpful article. [i] Mark Garcia in his book Life in Christ: Union with Christ and Twofold Grace in Calvin’s Theology :260. 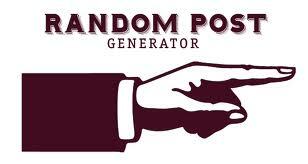 Thank you so much for posting on this Tyrell! It has most definitely helped me understand the Reformation more deeply. I will be sure to grasp all of this as its truly vital especially in terms of my beliefs & where I stand. This is why commited Lutherans are Calvinists and vice-versa.